Womanhood | Connect. Evolve. Thrive. Today the world lost a phenomenal woman- and a phenomenal voice. Maya Angelou died today and the world is poorer for her leaving. I have been thinking a lot lately of her poem- Phenomenal Woman. For years it has echoed in my head. As we are inundated today with images of emaciated models and told to emulate an ideal of beauty that is profoundly damaging, Angelou’s vision of womanhood is nurturing and sustaining. Womanhood is not stilted and stunted, contorted into unnatural poses as our fashion magazines display. Angelou rejoiced in the movement and sensuality of womanhood. There are so many ways to be a phenomenal woman, to be beautifully and wondrously alive. Angelou was unapologetically woman. She was unbroken and proud. She was beautiful in the fullness of womanhood. Every girl, every woman, should read this poem. We are all phenomenal women. 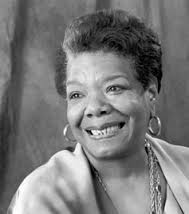 Maya Angelou is gone- but her phenomenal voice lives on. May she inspire us all to embrace our phenomenal selves.